Thanks to everyone who came for breakfast this week, I loved having you all here. Thanks for the comments and for letting me know what you liked and what you are going to try in your own kitchens. I can’t wait to hear how it goes. So, here were are, Friday (happy Friday) and the question remains, how to wrap up a week of posts dedicated to breakfast? Well, that’s easy! French pastry, of course. Isn’t it funny how pastry is often the answer to life’s questions? Should I go to college or take a break, travel and see the world first? Oh, I don’t know. Is anyone going to eat that last cinnamon roll? Why did I put off this paper until the night before it’s due? I know I put those Pop Tarts somewhere in here. I should have gone to Europe. Will I marry you? Ooooh, is that a bearclaw? Should I go to the gym today? Creampuff. Oh the irony. If you think French pastry requires a lot of training and skill, you are right. Sort of. True French pastry is an art and is mastered by those who spend years perfecting their craft. Thankfully, for those of us who are slightly less accomplished with no training and just a little bit of skill, the freezer section at the grocery store holds within its frosty depths the secret to creating French pastry at home. I promise, that’s it! 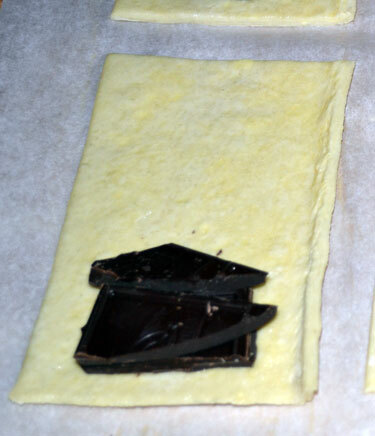 Two sheets of puff pastry (there are two in a box), two 3.5 ounce chocolate bars – I like the 60% cacao best for this, egg wash (1 egg beaten with 1 Tbsp. of water), and sugar for sprinkling the tops of the pastries. 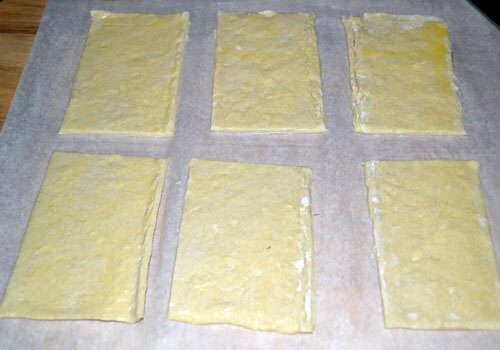 Thaw the frozen puff pastry for about 40 minutes so that it is easy to handle. 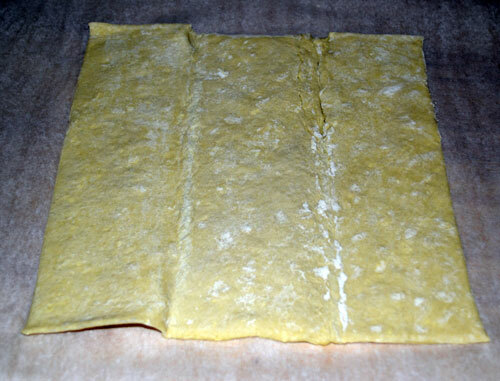 It will open out into thirds; I don’t even flour a board, I just put it on a piece of parchment paper. 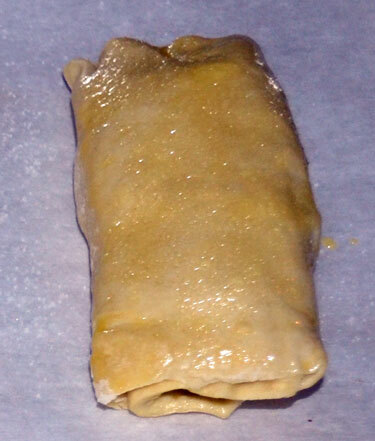 Slice the pastry lengthwise down the fold lines. And then slice each third in half so you have six pieces. 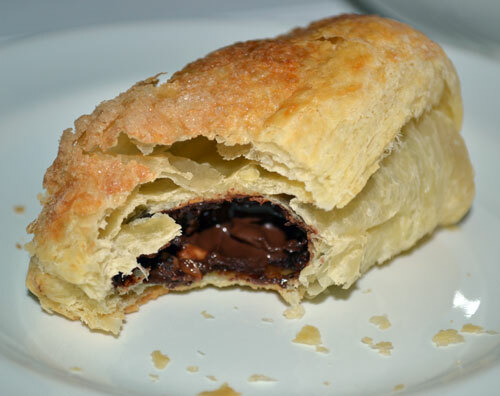 Brush each piece of pastry with egg wash. Place a little of the chocolate at one end of the piece of pastry and roll it up. Pinch off the ends to seal them up. 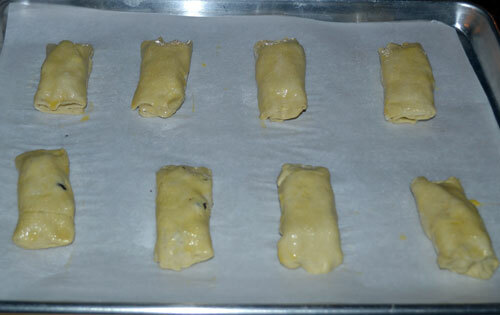 Place your pastries on a parchment lined sheet tray and put them back into the fridge for at least an hour. The pastry will be flakier the colder it is. If you are thinking ahead, put your pastries together the night before, cover them with plastic wrap and then finish and bake them in the morning. 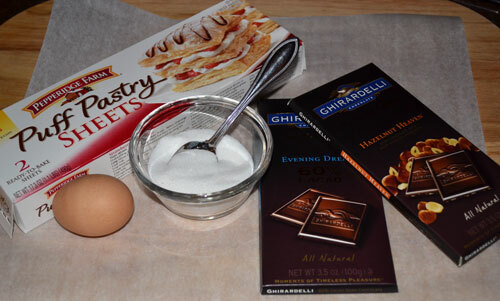 Just before baking, brush the top of each pastry with egg wash and then sprinkle with sugar. 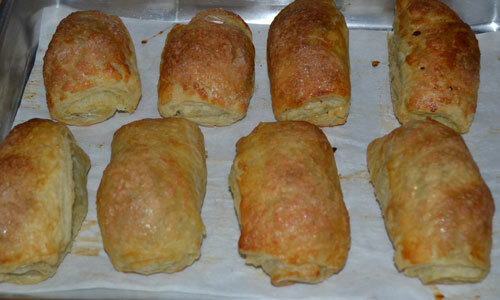 Crisp and golden on the outside, flaky and oozing chocolate on the inside. You are getting up to head to the grocery store right now, aren’t you? Go … Go, I don’t mind. I’ll just be enjoying my dainty French pastry with my enormous American sized cup of coffee. Strong. No cream. No sugar. Because that’s how I roll. Have a great weekend. I’ve got to run because I’ve got a sick little guy on the couch who’s just waking up and needs his mama. I’m saving him a pastry for when he’s feeling better. 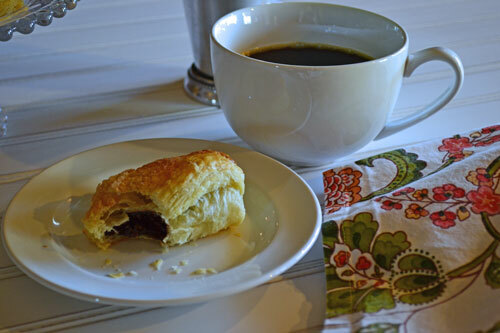 This entry was posted in Breakfast & Brunch, My Favorite Recipies, Sweet, Welcome Company, Welcome to My Kitchen and tagged baking, Breakfast, Brunch, Chocolate, cooking, food, French Food, French Pastry, Pain au Chocolat, Pastry on March 1, 2013 by Welcome Company with Danielle. yummmmm.. this is one of my favorites, chocolate for breakfast is the best..looks just delish… lovely post.. 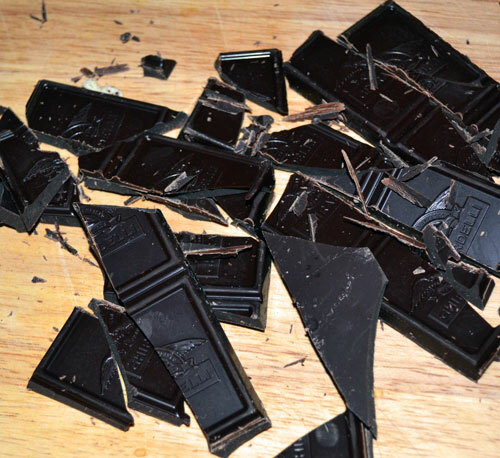 Thanks Sarah – I have to agree not much beats chocolate for breakfast! 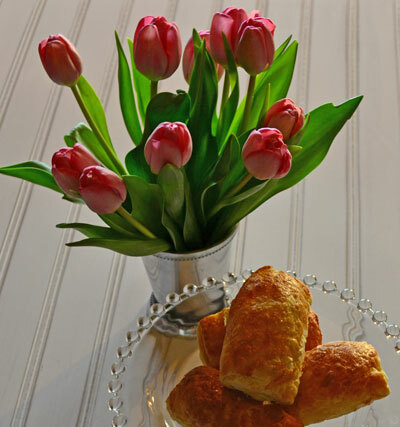 The last photo of the tulips and beautiful pastries on a crystal dish reminds me of our years stationed in Europe…when the presentation was just as important as the food itself. A picture that gives you the sensation of smell, and the words that create the illusion of taste….I do believe that chocolate is in my immediate future! Toodles! Thank you Cindy for the wonderful compliment. I’m not sure if I have more fun with the cooking, the writing or the photography but all three have turned this blog into a passionate hobby and just the creative outlet I needed. I have so much to learn about photography but for now, I am practicing a lot and will hopefully up my skill level when my last little guy starts Kindergarten next year and I can take some classes. Thanks again for the words of encouragement! These are my daughters favorites! but I’ve never made them at home. They’re on the list when she comes next month. fun! thanks for the post. They are wonderful and so easy, I hope she loves them! Yum, I love chocolate croissants! Thank you CCU! I am so inspired by all of the incredible photos out there in the blogoverse – yours included. I’m working on getting better and better and even had a lesson yesterday from a professional photographer friend. I think it will pay off!